Feb 9: Mayor's race a dead heat (47%-46%), poll taken Feb 3 -6. Feb 8: Obama endorses Alvarez. Feb 11: Faulconer crushes Alvarez by 9 points. David Alvarez is an earnest young man, and a fresh face. Kevin Faulconer is a boring old moderate Republican. But like almost every modern elected Democrat, Alvarez was beholden to the government workers' union political machine. Was Obama's endorsement what cemented that fact in voters minds? Or is it the cumulative effect of Obamacare, rewriting laws by executive order, NSA wiretapping, and drone strikes on children? 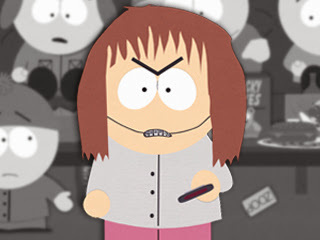 Janet Yellen is the voice of Shelly Marsh on South Park. Listen to Old Taffy Mouth's testimony today here. Spanish suicides rise to eight-year high.